This is amazing to view and realize how things used to be before every square inch was paved over with warehouses, stores, homes, etc. Milam Dairy Road used to be lined with trees and was a visual pleasure to drive on. Developers have managed to turn it into one of the ugliest congested roadways in the county now. Guest from 30-May-2013: Great story and I apologize for the delay in responding. From what I've seen at MIA I believe it, but the captain was taking a hell of a chance of losing his license if he got caught. Fortunately everything worked out. Thanks for posting! Guest from 11-Nov-2013: I thought it did exist where it went under Milam Dairy Road and I'll have to check the next time I'm in the area. Although you may not see the canal on the surface in various locales, the canal could be underground enclosed in a huge pipe. I know for a fact that this canal was enclosed in a huge pipe running east-west through Miami International Airport north of former runway 9L-27R (now 8R-26L) and the former taxiway Lima from the west side of the airport to LeJeune Road. I did a brief search for canals in the area and there is a S26 canal still on the maps that matches the canal in the above photo. It is one of the South Florida Water Management District canals that drains water in the western part of the county to Biscayne Bay and they have pumps to push the water eastward. Galen, I'm sorry but I don't have any access to those old records for the cargo buildings. The only thing I can suggest is to contact the Miami-Dade Aviation Department's Properties Division and see if they have the old leases in their archives that would mention the square footage and possibly the dimensions. Mr. Boyd, I am trying to get the dimensions on the three original cargo buildings in this photo for a 1/144 scale diorama project. Can you help with that sir? It was infamous because of all the cargo airlines that operated out of there, the wide variety of characters involved with those airlines and perhaps some shady maintenance practices on the old aircraft that flew the cargo. Throw in a bunch of crusty fly by the seat of your pants pilots, co-pilots and flight engineers, some of them sober and some of them not, and you have a scenario that was not duplicated anywhere that I know of. Why is MIA's northwest corner infamous? Is that the corrosion corner i have heard about? Good guessing Ray. 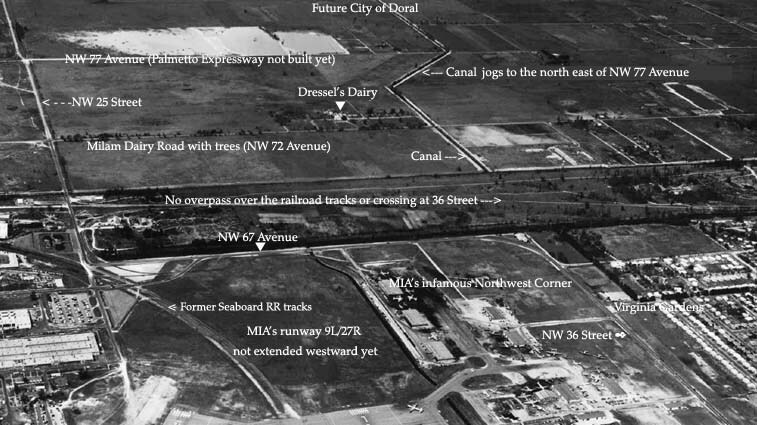 Since I put this photo up I've had a couple of old-timers tell me about the Seaboard railroad splitting the northern half of what is MIA now from the rest of the airports south of the track. The photo athttp://www.pbase.com/donboyd/image/97866432 identifies it as the Seaboard RR tracks and I modified the above photo to state that. When the tracks in the photo were closed to combine the airports into MIA, they were extended south and just west of LeJeune initially at the eastern end of this runway (former 9L-27R, now 8R-26L). The tracks proceed along the canal southbound and end up on the east and south sides of Perimeter Road going west. A few tracks then curve southbound under 836 and another couple of tracks go west around the long south runway (9-27) and then curve back east following the airport fence and then go north and under the overpass at 36th Street. These tracks, Perimeter Road and Milam Dairy Road were moved westward when the south runway (former 9R-27L, now 9-27) was extended from 9300 feet to 13,002 feet in the early 80's. That is the runway that goes almost all the way to the Palmetto, not the north runway depicted in this photo. The north runway (former 9L-27R, now 8R-27L) depicted in this photo was only extended a couple hundred feet from what is seen in the photo above. The current end of the runway is due south of the eastern end of the building to the right of the word "yet" on the photo. All of those cargo buildings have been demolished for new construction but I remember where it was because I used to photograph landing aircraft at that location for many years. I've been trying to figure out what you have labeled as ? road or railroad. From very slight curve, I'm pretty sure that was a railroad bed. I've been trying to place everything in my mind. I'm guessing NW 25th St was the southern border of the whole airport at one time. The rails that enter the airport now at LeJune and 30th St. likely went due west right next to this runway until they did the curve south to 25th St and 67 Ave. So I think the runway went right on top of this railroad bed. They must have rerouted the railroad to make the runway. But did they move it to where it is today along the 836 or somewhere else first? Some other aerial shots of the airport back then would likely confirm this. Like old runways, old railroad beds sometimes show up in aerial photos years after they disappear on the ground. In current aerials at maps.google.com I sort of see something just west of LeJune at 30th, but not enough to confirm that the rails went west. Still interesting to try to figure out where things were back then and how they've moved to make way for the airport's expansion. As for this runway's expansion, I remember it going to just 72 Ave, so that's way more than this photo shows. Now it almost touches the Palmetto at 77 Ave. Just the expansion is almost the entire height of this picture. Hi Martha old friend (sorry about the delay in scanning the post cards), yes, and it is labeled above with an arrow pointing down to it. It was a block or two south of the canal on Milam Dairy. Are you saying that is not Dressel's Dairy? Because it sure looks like it as I recall it and someone who worked there says that's it. The two buildings in the lower left hand side are airline maintenance bldgs. The long bldg was Aerodex/PanAm maintenance shop and the small one to the west was Eastern Airlines Test Cells. The test cells were used for repair and testing prop engines.